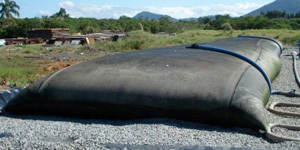 Our GeoTextile Products are used throughout the Caribbean Islands for an array of environmental applications. Our GeoTextile Tubes and Bags are used for dredging spoils containment, beach renourishment, land creation, levees, breakwaters, groins, erosion control and more. Our diverse Formed Fabric Concrete Systems are for erosion control, embankment reinforcement, breakwater armor, rip rap replacement, concrete slope paving plus much more. Our systems are environmentally friendly, proven more effective than older traditional methods while at the same time can save as much as 50% off the cost of the older methods. Because of the reduced cost and superior efficiency, our systems are fast gaining popularity throughout the Bahamas and all of the Caribbean Islands including Trinidad and Tobago, Turks and Caicos and Virgin Islands. Caribbean GeoTextiles, based in Atlanta, Georgia USA, provides marine and industrial GeoTextile products that used in environmental applications throughtout the Caribbean Islands including The Bahamas, Turks & Caicos, Virgin Islands, St. Kitts, Trinidad & Tobago, Cayman Islands, Dominican Republic, Puerto Rico and all of the island areas. Our GeoTextile Tubes, Bags, Silt Barriers and Turbidity Curtains are available in various thicknesses to suit your applications and are used in applications such as dredging cell replacement, erosion control, beach renourishment and breakwaters. We can provide and/or install fabric-formed concrete systems for erosion control and scour protection, segmental concrete block retaining walls, reinforced earth slopes and improved foundations. Our Fabric Formed Concrete reinforcement products can also be used in retaining walls, segmental retaining walls and panels and geogrid for the reinforcement of retaining wall systems and reinforced slopes. Our concrete mattress system is suitable for armoring geotextile breakwaters. Contact us today for more infomation. 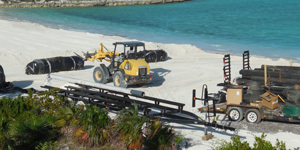 Caribbean GeoTextiles is also available for Installation or Consulting. Welcome to Caribbean GeoTextiles, your source for GeoTextile Tubes and Bags, Turbidity Curtains and Silt Barriers, as well as Fabric Formed Concrete Solutions such as Articulating Concrete Block Mattresses and Enviromat Concrete Slope Solutions. We offer GeoTextile Tubes and Bags and Turbidity Curtains for use in the Dredging and Marine Construction industry in the Caribbean Islands such as The Bahamas, Cayman Islands, Trinidad & Tobago, Antiqua and Puerto Rico, Domican Republic, Jamaica, St. Kitts, Virgin Islands, Turks & Caicos. These environmental protection products are also available to Central and South America, places such as Belize and Honduras. 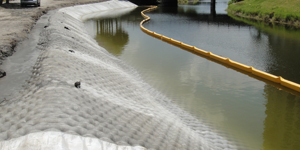 Our GeoTextile Environmental Silt Barriers such as GeoTextile Tubes, GeoTextile Bags, GeoTextile Booms and Turbidity Curtains are custom made to the specifications of your particular marine project. These GeoTextile Tubes, Bags and Turbidity Curtains are a cost effective solution to shoreline protection and erosion control. They also offer environmental protection during dredging of waterways, rivers, reservoirs, dams, harbors and marinas. Our GeoTextile tubes and bags are sand colored and blend into the environment. GeoTextile Tubes are used for erosion control, shoreline protection and desilting and dewatering from dredging in places such as the Bahamas, Exumas, Turks & Caicos, Virgin Islands, Belize and Trinidad and Tobago. The process of using GeoTextiles for dewatering avoids the building of unsightly holding cells and captures the spoils effectively. The spoils can then be easily transported away or used for land reclamation. We believe, as everyone becomes more environmentally aware, filling GeoTextile Tubes and Bags will become the only way to dewater and area that is being dredged in countries such as Guyana, Costa Rica, Puerto Rico, Turks and Caicos. For a cost-effective quote on your next Caribbean dredging, shoreline protection, breakwater or other environmental project, call us at 770-658-2903. Email us by clicking here. Caribbean GeoTextiles offers faric formed concrete products for Erosion Control, Armoring Breakwaters and Embankments and to replace the usage of expensive Rip-Rap. Our environmentally friendly and cost effective concrete systems outperform older methods of building retaining walls, protecting embankments and building breakwaters. Because our fabric formed conrete systems conform to the earth slopes, our systems outperform any other method of erosion control and armoring. Our systems include Hydrotex™ Fabric Formed Concrete Systems, HYDROCAST™ Fabric Formed Concrete Systems, GEOMAX™ High Strength Polyester Reinforcement Geotextiles, GEOMATRIX™ Polyester Geogrids, DELTA CONNECTION™ System and REVET™ Articulating Block Erosion Control System.